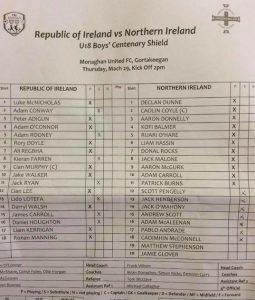 The Northern Ireland national under-18 schools football team (also known as Northern Ireland U18 schoolboys) represents Northern Ireland in association football at under-18 level. It is controlled by the Northern Ireland Schools Football Association (NISFA) which is affiliated to the Irish Football Association. The main competition competed for by the team is the Centenary Shield (founded 1973) which they won on the first occasion that they entered in 1996. The Northern Ireland under-18 schoolboys side also competes regularly in other minor tournaments and in friendlies. This entry was posted in Recent News, Special News. Bookmark the permalink.